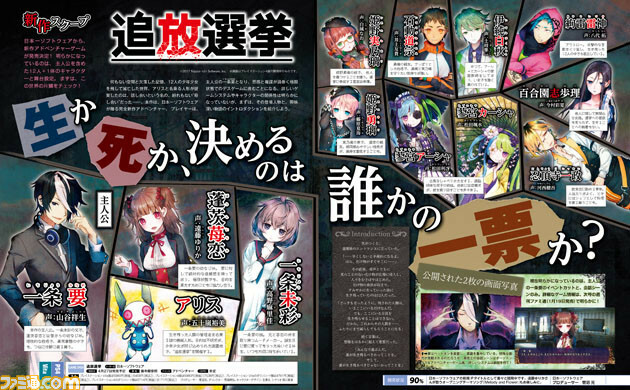 Nippon Ichi Software has announced Tsuihou Senkyo, or Exile Election, a new adventure game for PlayStation 4 and PS Vita, in the latest issue of Weekly Famitsu. First teased last week, Famitsu reports that the game is set in a closed amusement park where an “election” in which life and death hangs in the balance will begin. The game features 12 characters and a unique mascot character named Alice. Development is currently 90 percent complete. Update 6:40 a.m.: Exile Election will launch in Japan on April 27 for 6,980 yen on PlayStation 4 and 5,980 yen on PS Vita. The game starts when a mysterious mechanical doll named “Alice,” who calls itself the administrator, proposes a type of killing each other known as discussion. The player will challenge a death game swirling with schemes and expectations. The protagonist’s name is Kaname Ichijou (voiced by Yoshitaka Yamaya). He is Misa Ichijou’s older brother, who always keeps calm, even in strange situations.